Dr. John T. Santini, Jr.
Dr. Santini is a life science executive, serial entrepreneur, inventor, and scientist that has spent his career focused on the creation and growth of businesses developing next-generation pharmaceuticals, drug delivery systems, biosensors, and mobile health products. Prior his current roles as CEO of Vergent Bioscience and co-founder/Board Member of the Accelerator Life Science Partners’ portfolio company, ApoGen Biotechnologies, he served as the CEO or CTO of four healthcare startups – MicroCHIPS, On Demand Therapeutics, RadioRx, and IRISense. He has negotiated and executed collaborations with major pharmaceutical and medical device companies, and he has raised over $72M in venture capital and corporate funding for his companies. Dr. Santini has been honored as one of Popular Science Magazine’s “Brilliant Ten” and one of the Top 100 Young Innovators in the world by Technology Review Magazine. He has published in top scientific journals such as Nature, Nature Biotechnology, and Science Translational Medicine, has over 80 issued US and international patents, and his work resulted in a Technology Pioneer award from the World Economic Forum (Davos, Switzerland) and a Gold Medal from the Edison Awards in the Science and Medical, Game Changers category. 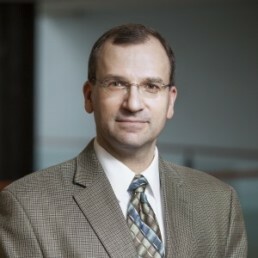 Dr. Santini obtained his PhD in chemical engineering from MIT as a National Science Foundation Fellow and his BSE in chemical engineering from the University of Michigan.